Shortly after the invention of the synthesizer technology to reproduce human speech with tuned voices stored in ROM's (integrated circuits) this funny product appeared. The idea behind this product was similar to other mathematic games like the DataMan: Solve easy calculations during an interesting game. More than 100,000 random and preprogrammed problems are stored in the ROM´s. Math games such as "Number Stumper" help stimulate logical thinking. "Greater than/less than" exercises build the ability to compare number values. This educational toy was rated by Texas Instruments for childrens aged between 6 and 12 years. An alphanumeric display was used as feedback during typing words. Other products in the Speak & line cover spelling and reading words. Compare this Speak & Math with both Speak & Spell and Speak & Read. Dont't miss the appearance of the Speak & Spell in the movie „E.T. - The Extra-Terrestrial“. Do you know Qubais Reed Ghazala ? Get more tunes from your Speak & Math with circuit-bending. An inside view of some dismantled Speak & Spell products could be found here. 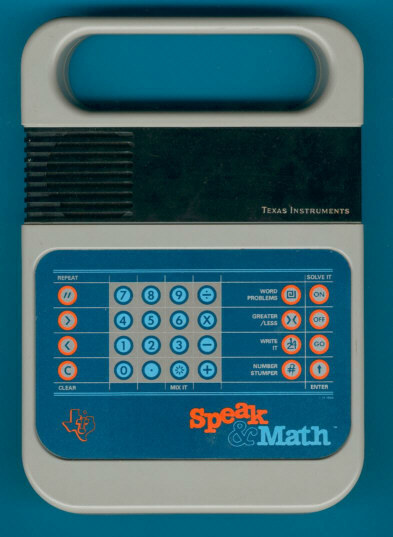 A compact version of the Speak & Math without display was sold in France (le Calcul magique), Germany (Mathe-Fix) and Italy (Dotto Contaparla). Don't miss the rare Les Maths Magiques sandwiched between the Speak & Math and the Speak & Spell Compact. View the more serious Language products like the Language Tutor. Press the Play button and listen Speak & Spell tunes. This Speak & Math is an early one. Please notice the gold lettered "Texas Instruments" on the display screen and the large "TI" logo on the keyboard. Later models got a slightly different design. Compare a later model here. In the United Kingdom an identical product was sold as Speak & Maths. Don't miss the rare Magic Wand Speaking Reader. This product came out shortly before Texas Instruments discontinued its Consumer Products Division in 1983. Later the Super Speak & Math was introduced with a multiline LC-display.